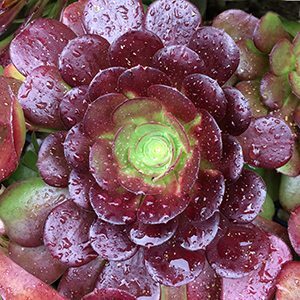 With deep chocolate to purple foliage contrasted against a bright green centre, Aeonium velour is a brilliant variety that grows well in containers as well as in the garden. 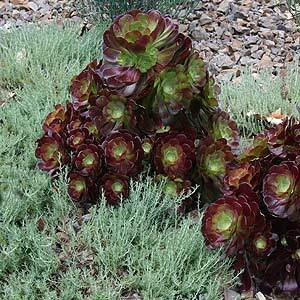 This is a rosette forming plant that does not grow the long stems of some other Aeonium arboreum varieties. The plant is compact growing with tight rosettes. With its low growing nature it is suited as a ground cover plant. Use it beneath taller varieties, or grow it it in a container where its spectacular foliage provides colour year round. Like most Aeoniums it does flower, yellow flowers on tall stems in summer once established. This is a plant that requires a sunny position and a well drained soil. Use a good quality, fee draining potting mix. In the garden ensure that drainage is good. If need, risked the garden bed a little to improve drainage. Once established, this is drought tolerant easy care plant. Soil Humus – Well drained soils. Foliage – Deep Chocolate to Purple with agreed centre.